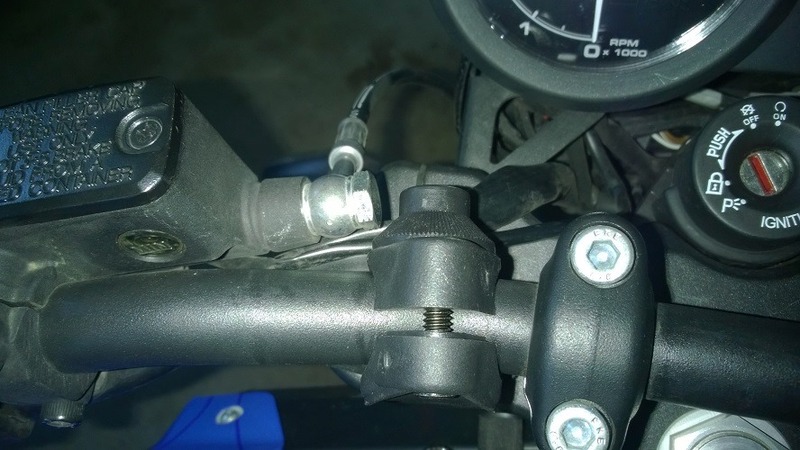 I just picked up a National Cycle Deflector DX and ran into two problems while assembling it. 1) I’d incorrectly measured the diameter of the handlebars. The parts I’d ordered are for a 7/8″ bar and the Empulse handlebar might be thicker (one inch?). 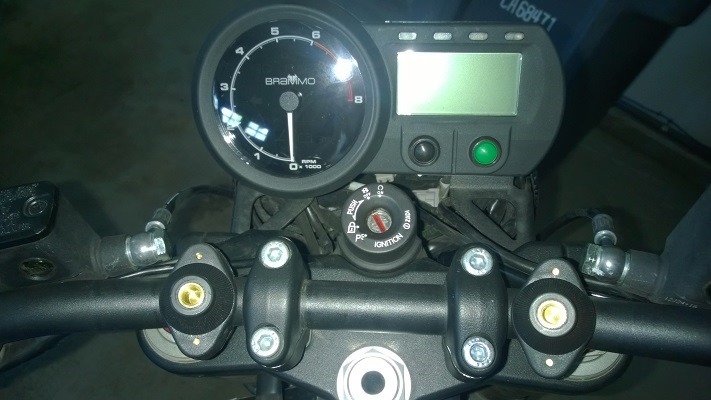 2) There are many cables zip-tied along the handlebar except for the gap in the center next to the keyhole. Clamping something on top of these wires would likely damage them over time, but the gap in the middle of the handlebar isn’t wide enough for two mounting clamps with quick-release knobs side by side. I wondered how other Empulse owners installed this screen. 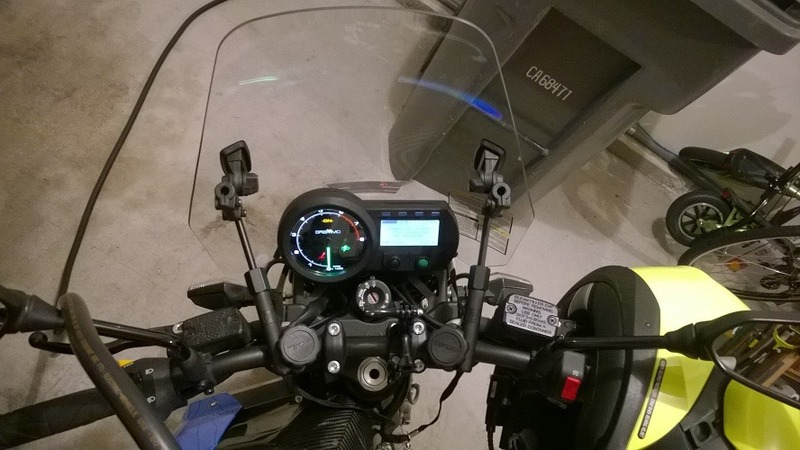 In the photo, I positioned the shield approximately where it belongs, but of course it’s not attached properly–the windshield’s clamps are resting on the mirror stalks instead of the handlebars. Good news, though. 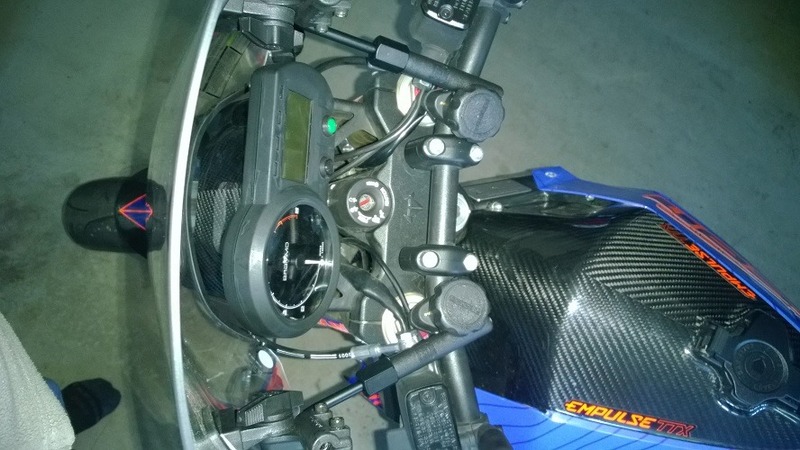 After getting over my reluctance to cut the zip ties guiding wires along the handlebar (picture 1), and going ahead with attaching the clamps that seemed too narrow in diameter to fit on the handlebars (picture 2), the rest of the assembly wasn’t much trouble (picture 3). National Cycle customer service said that the clamps were meant to be a little small, but would expand to fit over time. I guess they have a point, because if I’d gotten the 1” size, it might have been too loose. Here are two front views. It’s hard to see unless you know what you’re looking for, which is just fine with me. The idea is to have a windscreen that doesn’t take away from the look of the bike. A tinted windscreen would have drawn attention to itself. 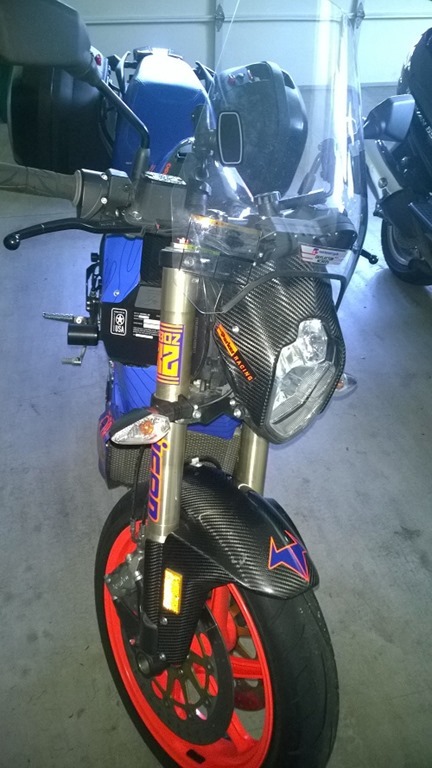 This is a sport bike, not a cruiser, after all. 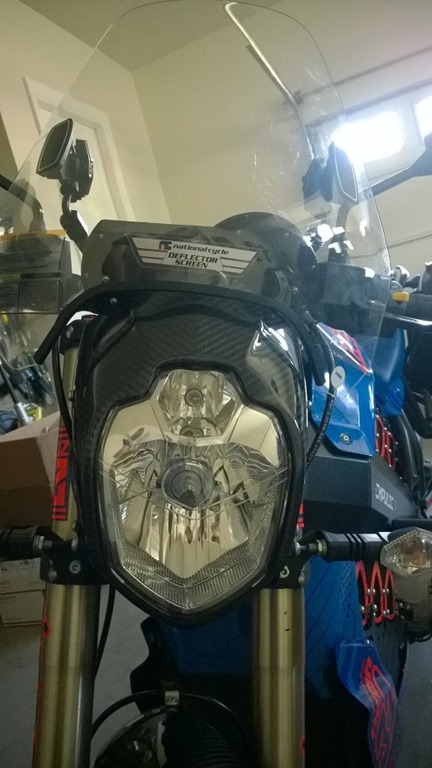 The way I initially installed it, it rests on the headlight fairing. 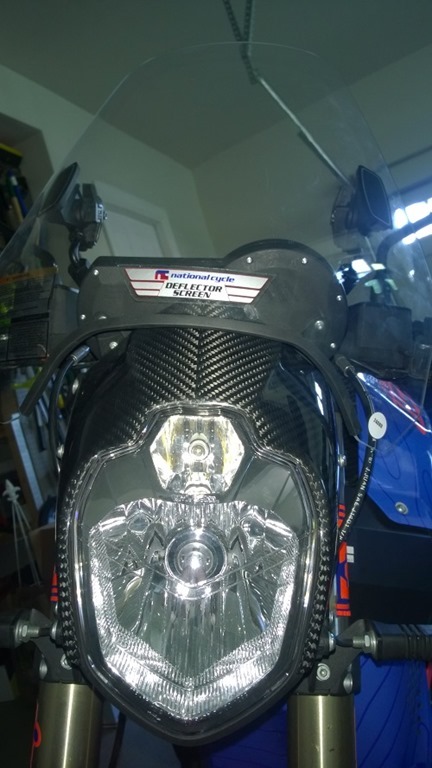 I don’t yet know if this will cause wear marks to appear on the fairing, but after one test ride, it doesn’t appear to have done any noticeable damage. 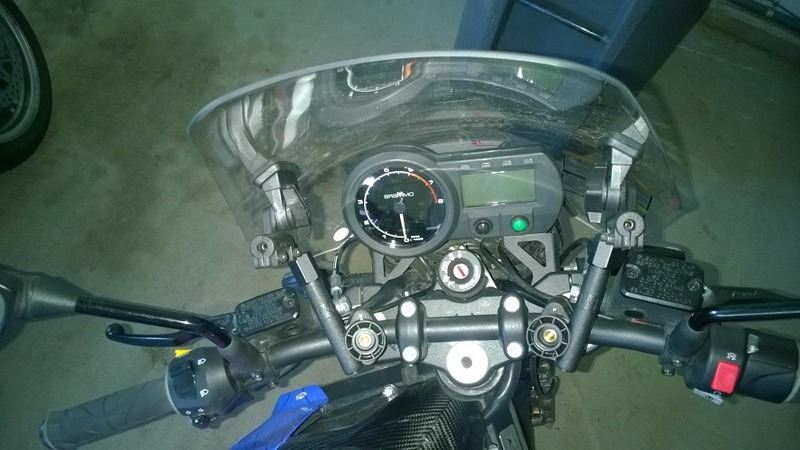 From the top, looking down the windscreen edge-on, you can see that there is plenty of clearance for the dashboard. So with the screen attached, I went for a test ride. 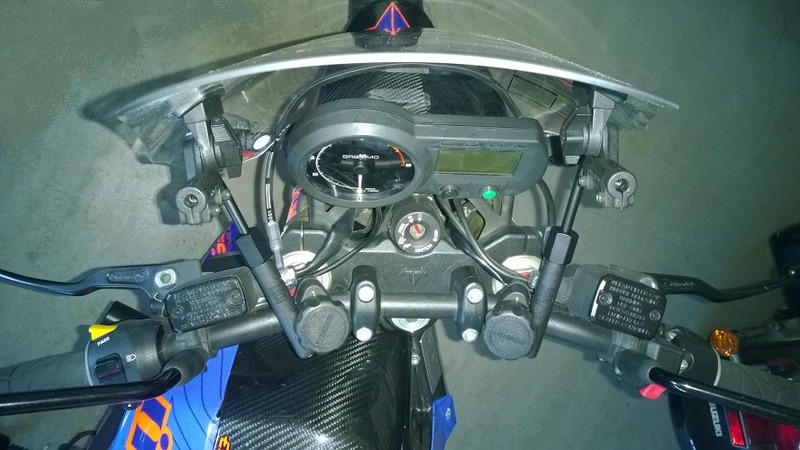 The screen was securely attached and didn’t wobble or change position at speeds of up to 50 mph, despite the 1/4″ gap between the halves of the clamps on the handlebar. I was hoping that the wind would be deflected above my head so that there would be less noise around my helmet, allowing me to ride without earplugs and hear my helmet radio. However, the screen didn’t calm the air around my head. Instead, because the screen only came up to my neck in height, what it protected was my chest, leaving everything from the top of my shoulders and above in the wind. Although the screen fits in front of the dashboard, when I try to tuck behind the screen to be protected from the wind, it is uncomfortable fitting my head behind the screen. Not that I’m inflexible, but I feel like I have to compress my spine because I can’t slide my rear end further back to make room for my head without running into the sudden upward curve of the seat to where the passenger would sit. Also, with my head that low, I’m either knocking the helmet into the screen or craning my neck to look forward properly. 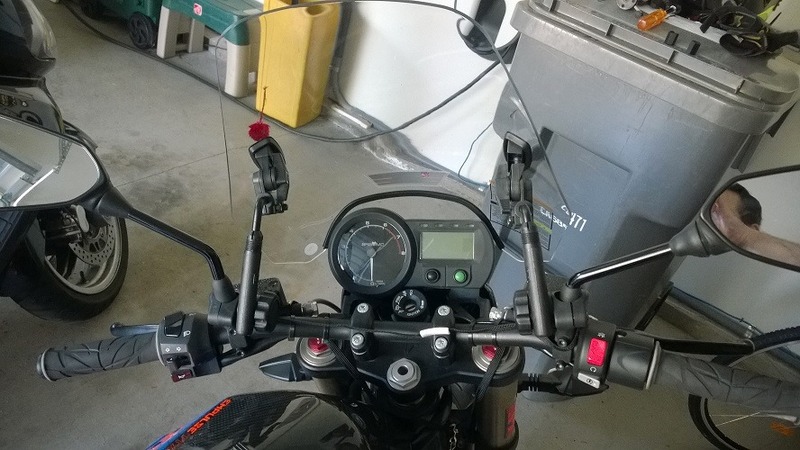 Initially, the windscreen was angled parallel to the forks. I will see if tilting the windscreen more vertically will help. If that doesn’t help, maybe I can rest the bottom of the windscreen on the top of the dashboard to raise the top edge closer to my eye height, where I’ve had success with windscreens on cruisers and scooters. If these workarounds fail, then I might have to return the screen for something taller than the 15” height of the Deflector. Maybe something 20” in height? 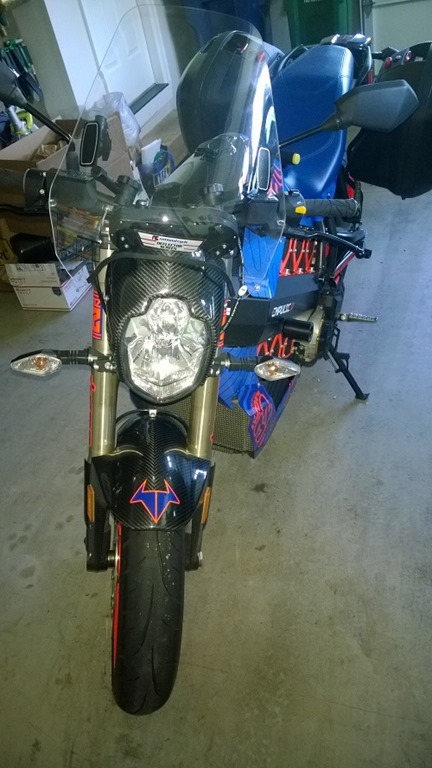 This entry was posted in Brammo, Motorcycle, Riding and tagged windscreen. Bookmark the permalink.